I bought this album in geeze it must have been "73 in a head shop complete with paraphinalia and incense. I think it's his greatest work along with the jams from the 20th anniversary Layla ablum! What get's me is the stamina displayed, the technical work and the subtlty of his use of the wah pedal all you so called expert critics should go give it a re-listen; the second issue (Live at the Filmore) has mistakes in it; hats off to Eric for keeping his ego in check and being human like the rest of us. Both are sizzling hot and btw the studio version of "Let it rain" is so pansy; Played live it's a man's song sung by a man! This is in my opinion the best intro to Derek & the Dominos that one can have. I saw them in December 1970 @ the Eastown Theatre in Detroit and they were superb. I also own about every "underground" recording of that UK/US tour for "Got To Get Better In A Little While" which I understand is back on Eric's playlist for his current American tour. I had originally heard this collection back in the early seventies when it was released as 'In Concert'. After the stunning Layla album this was somewhat of a sloppy, cobbled attempt of a live set. Fast forward to the remake, re-mastered 'Fillmore' collection, you find a similar set of songs, except these sound like they're being performed..
Do yourself a favour, buy the Fillmore set, and turn the 'In Concert' disc into a frisbee. A great live album that encapsulates the sound of the Dominos (Brownie at her finest). 'Bottle of Red Wine' and 'Got to get better' are personal favorites. Claptons husky voice brings another quality to the recordings that is wonderfully complemented by Bobby Whitlock's backup vocals. The slur in Clapton's voice as he introduces 'Nobody knows you' indicates the state he was in during this period yet he then rips into the most heart-wrenching emotion filled guitar intro that makes you just want to cry. The only negative comment is the absence of 'Layla' and that 'Crossroads' isn't the same arrangement as done with Cream. An essential live recording that wonderfully compliments the studio album. This CD is a solid live album. Its a must for any true Eric Clapton fans library. It opens with the only complete version of "Got to get better in a little while". The version on his Crossroads box set is incomplete. Next is "Why does love got to be so sad". This turns in another strong performance. Next is my personal favourite "Key to the Highway" which has extended lyrics compared to the version on Layla. Key to the Highway is one of Clapton's all time classics and he does it justice here. Next is an average performance of Blues Power, and a very strong "Have you ever loved a woman". This to me is again on of his classic performances of his career, The side is completed with a very strong version of "Bottle of Red Wine" from his first solo album. Bottle of Red Wine has a great solo and is well worth the listen. Side 2 starts with "Tell the Truth" which again is good but not one of his best. Nobody knows when your down and out is very strong one of the better songs on the album. He does a great acoustic version on "Unplugged" as well. "Roll it over" is a song that he was doing at the time that never found its way to an album but appears here and on Crossroads the box set. Presence of the Lord to me is almost a waste of time. The one thing of interest is that he sings instead of Stevie Winwood. Next he does the Jimi Hendrix song "Little Wing" which has never been as good as the Jimi Hendrix version but merits a listen. He makes the song his own. Let it Rain is next with drum solo and break, Somehow this song loses something live and he finishes with the standard "Crossroads" this version is slowed down but very strong and well worth the listen. Overall this is a solid live album. The introduction to "Blues Power is one of the highlights of this performance. No Eric Clapton collection is complete without it. A must have for every blues guitarist! The version of "Have you ever loved a woman", features some of the best and most emotional blues playing by Eric. If you wish to hear some of Eric's work from the dominoes period, this is an album, that can't be ignored! The album is really a 9 and a half, but I'm giving it a ten just for kicks. 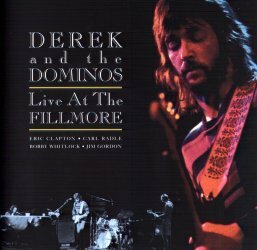 Though not quite the same as "The Allman Brothers Live at Fillmore," It's still a great live album that shows Derek and the Dominos live set. It features all the band members: E (As Billy Preston calls him), Bobby Whitlock's soulful vocals, Carl Radle's grooving bass lines, and Jim Gordon's driving drums. However, Duane Allman does not appear on the album, making Eric the center of attention on guitar and vocals, (Bobby Whitlock only sings one brief lead line on "Tell the Truth".) This album would be even better if Duane appeared on it, Eric would have more freedom to solo and not worry about rhythm guitar. There are three songs that have really caught my attention. One is "Got to Get Better In a Little While," a great song which my band and I have played many times. Some say this version of "Why Does Love Got to Be So Sad," is better than the studio version it being longer with many dynamics and and a lot of soul. I personally think the studio version is better because 1. It's faster, (Like many songs on the album, this version lags) and 2: The interplay between Duane and Eric on the studio version is incredible. Lastly, "Roll it Over" is a fun driving song I have not heard from them before with some cool wah work and swirling Keyboards. With all this, You got yourself a great live album well worth the money. Do yourself a favour and give this a try. Amazing, Clapton at his very best after that album his music took a slight turn . When I first heard the record I had to check the cover twice to see if its an Eric Clapton album I never heard Eric Clapton play like that or sing like that. With Bobby Whitlock by his side Eric is ten times as powerful. A lot of guitarists disagree that Clapton is an amazing guitarist I don't think that they heard this album before! If it's "Clapton the Guitarist" that you love, this is the album to have! This is a band and a concert recording built around Eric stretching out and playing long solos, one after another, some rough and out of control, but most lightning fast, melodic and full of a kind of energy and fire missing from many subsequent albums. The vocals aren't much - if it's Eric as ballad crooner you love, this will be a disappointment. But put on "Why Does Love Got to Be So Sad" or "Let it Rain" ("Live at Fillmore" versions still the best) and marvel at how good Slowhand can be and what a great band this group could be when they just rocked along allowing Clapton to take off and play his heart out. There's something to like in almost any EC album, but this is the one to listen to when you just want to lose yourself in an hour or so of fiery and tasteful rock/blue guitar. On the evidence of In Concert and Live at the Fillmore, the Dominos in performance were an uneven outfit. On the one hand there were moments of white-hot brilliance (Why Does Love... and let it Rain from In Concert, Key to the Highway and Little Wing from Live at the Fillmore) and on the other hand sloppy, uninspired versions of songs that were never that great to begin with (e.g. Roll it Over and Bottle of Red Wine). Problems are compounded by the fact that Eric's vocals at this point in his career are very weak. Undoubtedly, the Dominos possessed great potential both performance and songwriting-wise, but unfortunately they disbanded too soon to realise it fully.